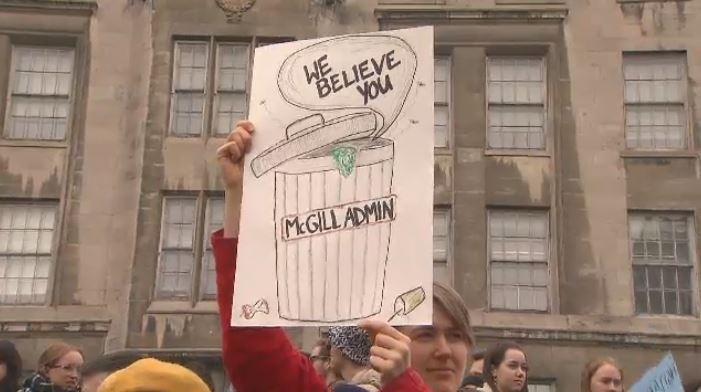 Students from McGill and Concordia Universities joined forces Wednesday to protest over recent allegations of sexual violence by professors. About 1,000 students walked out of class and came together for a joint rally outside the administration building on McGill's downtown campus. The students were protesting how both universities have handled complaints of sexual violence and harassment. Student leaders from both schools spoke, with many saying administrators aren't doing enough to protect students or to encourage victims to come forward. In January, two Concordia teachers in the creative writing department were removed from their classes pending an investigation after they were accused of sexual misconduct. In March, a former Concordia philosophy student filed a complaint with the Human Rights Commission, claiming the school did nothing to help her when she accused a professor of sexual harassment in 2009. Recently, members of the McGill University Students’ Society called for an external investigation into how that university handles allegations against professors. They say adminstrators haven't acted despite repeated complaints against some faculty. Some speakers called on students to boycott classes of possible abusers. “Professors who abuse their power, who are predators, and especially to black, Indigenous and women of colour. And I call you to do the same. I really do. We can't just stand here and have signs, we need to put our words into action,” said Andreann Asibey, president of McGill’s Black Students’ Network. McGill's student society wrote an open letter to the administration which now has more than 2,000 signatures. 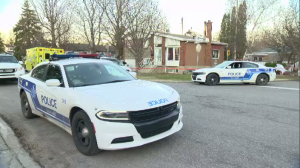 So far, McGill has not issued an official response. Concordia formed a task force on sexual misconduct and sexual violence and is expected to release a report later this year.